Is the Pope a Man of the Left? Progressive Halo or Wholly Rhetoric? Pope Calls Out Climate Deniers, But Will the Vatican Divest From Fossil Fuels? On Friday morning Pope Francis addressed the United Nations. Many leaders of the world were in attendance. He spoke about many things geopolitical, war, the environment. His speech, in my mind, was again a little muted compared to the kind of language he’s used in the past. But now joining us to deconstruct some of the speech and talk about the significance of it, first of all joining us from Northampton, Massachusetts, is Vijay Prashad. Vijay is a professor of international studies at Trinity College and author of many books, including his latest, Letters to Palestine. And joining us from Washington, DC is Medea Benjamin. She’s co-founder of the peace group Code Pink, and author of Drone Warfare: Killing By Remote Control. Thank you both for joining us. JAY: The pope in other speeches, particularly in 2013 when he made his first big statements on the world, his language was very, very tough. He called the role of finance essentially the creation of a new tyranny. His language wasn’t quite that strong today at the United Nations, but here’s a clip of what he had to say. JAY: So what do you make of that in particular, but more in general the pope’s critique of–he doesn’t I think often use the word capitalism, but it’s kind of clearly what he’s talking about. And sometimes that critique gets, the words get quite strong. He’s speaking here at the United Nations, I saw one shot while he was speaking of Merkel from Germany, and Germany of course is playing exactly the role of finance being extremely exploitive, and Greece the best example of it. Vijay, what did you make of it? 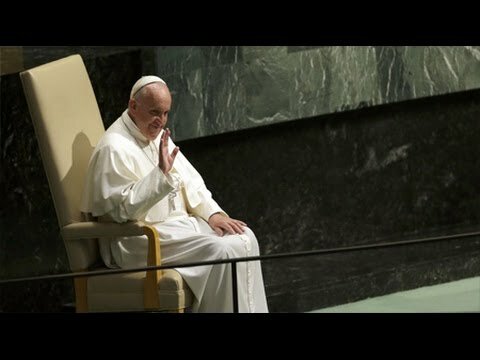 VIJAY PRASHAD: Well you know, firstly it’s interesting to have the pope–this is the fifth pope to speak at the United Nations. He was called by conservatives in particular a communist, a leftist, et cetera. But the fact of the matter is this pope is from Argentina, he’s the first pope from the global South. And in many ways what he was saying is the consensus in Argentina, in South America, in the Caribbean, in very many parts of the global South. He used the language of dependency, he criticized the way financial economics is cutting back against people’s wellbeing. None of this is considered radical in most of the globe. It’s only in the North that some of these statements are surprising, particularly because over the last 30 years it has become relatively rare to hear people speak openly about the wellbeing of populations, the need to address questions of poverty, et cetera. So in that sense it was refreshing to hear the pope speak. But I think it’s misleading to see him as somebody of the left. It’s clearer to see him as a man of the South. JAY: Medea, what’s your take? BENJAMIN: Well yes, I think for the U.S. audience his talk in Congress was quite radical. For the UN this isn’t radical language for most of the world. But it is for some of them. Talking about the thirst for power, talking about the unlimited consumption, the culture of waste, the social exclusion. These are things that are not everyday ideas for many people here in the United States. I think he toned down his language from the more explicit anti-capitalist language that he’s used in the past. But I think the message stood out loud and clear, that the economic system that we’ve created is one that leads to the exploitative nature that leads to social exclusion, that leads to a whole series of evils that are plaguing the planet. So I think it’s great language and a great message. JAY: Vijay, the people he’s talking to who kept applauding all throughout his speech, including all the various leaders and ambassadors from various countries, almost all, maybe not all. But almost all of them are practicing exactly the opposite of what he was calling for. And many are the perpetrators of exactly the kind of speculation and financial exploitation that he’s eviscerating there. But he doesn’t call on ordinary people, really, to do anything about the situation. The closest he got to it is this. So it’s kind of–we should allow people to have their dignity. Well, who’s the we? It seems to me we is the people he’s talking to, in other words the elites that are running the world. But he doesn’t call on the suffering masses to take things into their own hands. It doesn’t really come even close to that. Vijay? PRASHAD: Well you know, he also–let’s not forget that this is the pope. The pope comes from a certain tradition. If you go back and look at John Paul II’s speech to the UN in 1995, he spoke about things like the risks of solidarity, the risks of peace, et cetera. There is a certain tradition of the pope coming to the UN and in a way excoriating or laying out an agenda for peace, at least, at the very least. This pope also talked about the importance of the culture of waste, the need for the environment to have its rights. He put certain things on the agenda which others have been loathe to talk about directly. But I think you’re right in one respect, which is that he has also come to the General Assembly session where they’re going to start talking about the so-called sustainable development goals. This is the millennium development goals part two. Neither of these two proposals, whether the agenda of millennium development goals or the new proposal of sustainable development goals, neither of these propose an alternative mode by which to raise people out of poverty, make sure there is water supply, make sure there’s sewage. Both of them basically follow the classic neoliberal policy slate. So there’s nothing new here. And also keep in mind, not to rain on the parade of the pope being here and raising important issues, but the Vatican has lobbied hard against one of the sustainable development goals, and that is gender equity. So at the same time as I think it’s important to welcome any critique of the way the world order is organized, you should welcome the call for peace. There are some great limitations to what a religious figure can do at a setting like the United Nations. JAY: Medea, picking up on a point you made a few minutes ago. In most of the world, and I think Vijay made the same point, nothing he’s saying is very radical. A lot of mainstream social democratic politicians use somewhat similar language, especially in the South. But if you take climate change in particular, and again in most of the world it’s not so controversial, in the United States, what do you make of how strong he’s been on climate change? Like, I’ve been wondering to myself why the heck does John Boehner and the Republicans, and of course Boehner resigned on the same day the pope spoke to the United Nations. I don’t think it’s because he saw the light after walking and talking to the pope. The confrontation he made of a Republican denier position on climate change, what do you make of that? And what I mean by what do you make of that is if he then doesn’t go one step further about some of the more concrete things that need to be done about it, does he end up actually just creating space for a more neoliberal solution to the climate change issue? Like, he sits next to President Obama who’s done some moves on regulation, but most of his big proposals were cap and trade, and various things that cause financialization. I don’t know if it’s naivete on the pope’s part, or the limitations of just who he is and who the Vatican is. But what do you think the objective effect of it all is? BENJAMIN: Well, I think you might be asking too much of the pope. He’s not going to say arise, ye masses, and throw off your chains. He is educating people. And in the context of the United States, in a Congress where you have so many elected officials who won’t even recognize that global warming is a reality, for him to not just say it but to put it in the context of a moral and ethical framework is very important. Somebody like Boehner, there are a lot of people in our country who are devout Catholics, and who then have to really question themselves when the pope comes out so strongly on issues like the environment. I think it’s going to cause a lot of them to rethink their positions, and maybe it’ll mean that in churches across the United States there will be a stronger call for people to get involved around environmental issues, join local environmental struggles. Certainly I think it will give an impetus to what’s going to be happening in Paris. So I guess my expectations are not as high as yours, Paul, but I think the fact that he’s done such a marvelous job putting the issues in the context of an ethical framework that any person who is not only a Catholic, but he says people who believe in having an environment that is sustainable, have to take some kind of action. And then I think it’s up to the people to find the action to take. JAY: Yeah, let me say, I had no–first of all, when this pope was elected I had no expectations at all. And it’s not that he’s not living up to my expectations because if anything he’s surpassing my expectations in much of his language. It’s more I’m trying to get an analysis and a take on what the objective effect of what he’s saying and doing–because a lot of the left and a lot of liberal America and the world are extremely elated with all of this. And I think the language is strong, and I think it does open space for certain political discourse, especially in the United States that doesn’t have a lot of space. But it’s missing some rather critical stuff, if you really want to talk about effective change. And certainly a man from the South and from Latin America that has seen such political transformations and mass movements, or in Europe where he’s not very far from Greece and sees what’s happening there. I think even a pope, if he–to be, what can I say, live up a little more to his own words, there could have been some more responsiveness to that situation. But let’s move on. Vijay, he spoke quite a bit about the United Nations and the role of international law and norms. Here’s a quote from the speech. Vijay, I thought this was actually one of the strongest paragraphs in the whole speech, and he wasn’t perhaps looking at the American delegation. The language is not overt, but it’s pretty obvious who he’s talking about. What did you make of his whole take on that? PRASHSAD: Well, this is definitely the strongest critique. It certainly pokes a finger at the United States’ illegal war on Iraq in 2003. it certainly questions, at least I read it that way, questions the utilization of the UN for Western ends. Here the test case would be, let us say, Libya 2011. I think this was very strong. But again this was in line with Vatican policy. John Paul II, a much more conservative pope, also championed the UN Charter when he came to the United Nations, spoke of the need to respect international values, et cetera. I think here there’s something very interesting, as well. When the pope came to the United Nations, the Holy See’s flag flew from the building. This is of course only possible for a member state of the UN, not a non-member observer state like the Vatican. The way in which the flag was flown was that the other non-member observer state, which is Palestine, put forward a resolution in the General Assembly which passed unanimously, allowing the Vatican’s flag to fly. In other words, we must understand that when he talks about the importance of international law and about the United Nations he’s not only talking about the United States and its use of the Charter or misuse of the Charter. He is also being very outspoken about the question of Palestine, which is at the core of some of the UN’s longest dilemmas. JAY: Medea, he also referenced specifically the Iran agreement, the Iran nuclear deal. And here’s a clip of that. Medea, again, this is poking the finger, right, in John Boehner’s eye. The Republicans’ eye. I know he’s not speaking at Congress, but Boehner was watching. He was supposed to make a statement about his own resignation and was waiting for the pope to finish his speech. This was a direct attack on much, most of the Republicans or all the Republicans on the Iran deal. I still can’t get exactly why they invited him. But at any rate, what did you think of that statement? BENJAMIN: Well, I think it’s fabulous. And he calls for the use of diplomacy in other areas of conflict around the world while the Republicans and many Democrats are calling for greater use of force. He also calls for a nuclear-free world. He makes it implicit that the other countries, including the United States, are not standing up to their obligations as part of the Non-Proliferation Treaty, to eliminate their nuclear weapons. He also calls for greater equity within the United Nations itself, the Security Council, an important message for countries like Brazil and India. So I think a number of the things that he said–I mean, the language that he used in Congress about the arms trade was incredible, talking about people selling weapons because of money, and this is blood money. These are, imagine the Northrop Grumman and the Boeing and all of these contractors who are constantly in the halls of Congress. I think he shamed them. So I think a lot of these issues that he brought up around war and peace are certainly ones that will cause many Catholics who have been promoters of greater militarism to reflect upon. JAY: Vijay, finally, do you think the language he uses, the strong language, will have any influence or effect on elite politics? PRASHAD: The word Medea uses is very important, which is the word shame. You know, these are important religious leaders, the pope being one of the most visible. Dalai Lama is another. I mean, there are a series of them. They have a certain moral gravity. People who don’t believe in religion perhaps don’t have an understanding of the power of the moral voice. But they do play an important role, and I think in that regard, despite the fact that they may not be calling for anything specific I think raising the issues is valuable for the broader human movement. So I’m very happy to see him raise the issues. It’s up to others, I think, to take up these issues in a more concerted way. JAY: Yeah, I agree. It is a little ironic that a man who leads an institution who–much of its role has been to obscure reality and create a sort of mystical attachment to, certainly in its roots, various aristocracies and ruling classes and so on and so on, that the man that leads that institution is talking a heck of a lot more realistically about the world than most of the politicians we get to hear where we live. Anyway, thank you both very much for joining us. BENJAMIN: Thanks for having us on. 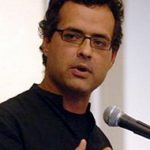 Vijay Prashad is the Director of Tricontinental: Institute for Social Research, Chief Editor of LeftWord Booksand Chief Correspondent at Globetrotter.